I can’t even recall when I first saw Herobear and the Kid: The Inheritance by Mike Kunkel. My older brother Joseph discovered the book at the library and brought it home. Comic books and graphic novels weren’t all that interesting to me back then, so, after scanning through the book, I put it down, and forgot about it until, in June of last year, I decided to check out that book I had “read” several years before. This time, I finished the book, which was very enjoyable. 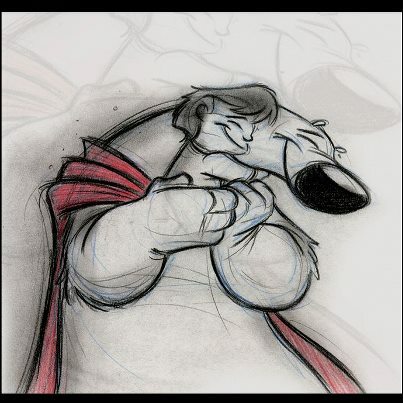 Mike Kunkel, the author and artist of Herobear, was an animator for Warner Bros., Sony, and Walt Disney productions before he created Herobear. This career in animation shines through brilliantly in his artwork. I agree with my older brother’s observation that reading Herobear is almost like watching a movie. Sequences of movement run together very smoothly and it can almost seem like the characters move on the page as one reads. 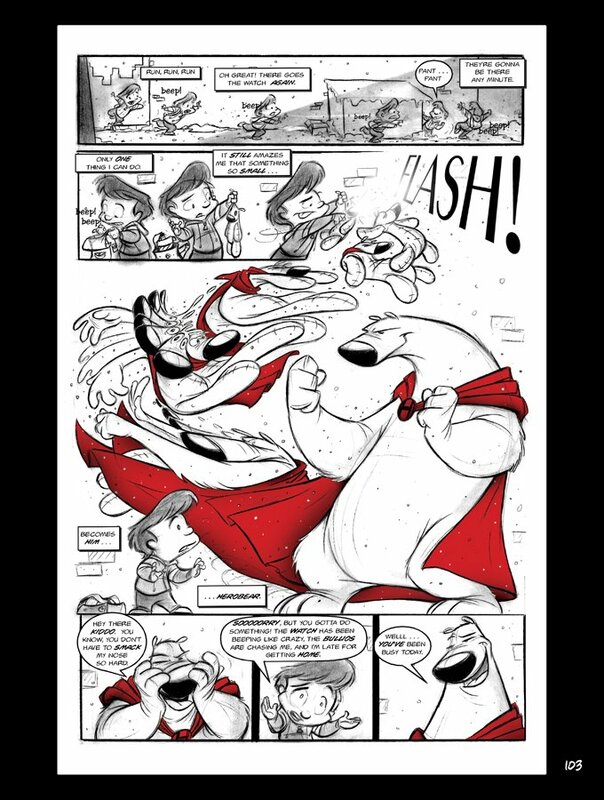 Kunkel’s loose pencil art style helps to create the animated effect of this book. In addition to this, the expressions of Mike Kunkel’s characters are wonderful. Kunkel succeeds in making every look on a character’s face humorous and memorable, which helps to bring the main character Tyler’s overactive imagination to life. Taking into account that this book is a graphic novel, its artwork is obviously very important to making it worth reading, but the book has an excellent storyline too. Herobear and the Kid is narrated by a young boy named Tyler whose grandfather dies. In the grandfather’s will, Tyler’s parents receive a mansion and Tyler himself inherits a broken watch and an old stuffed bear. In this story, Tyler is relating the part of his childhood where he encountered his “biggest beginning from a most difficult ending” (13). The “most difficult ending” that Tyler mentions is his Grandfather’s death. To discover what the “biggest beginning” is, you’ll have to read the book yourself. Because Mike Kunkel is a Christian, he includes biblical ideas in Herobear. In the third section of the book, Tyler wonders what motivates a hero to serve, protect, and defend. Initially, he thinks that they might act for glory, but after his first heroic adventure, Tyler realizes the truth about heroes: they don’t protect others because they love glory, but because they love others. Then Tyler states “And like it says in a good book about heroes: ‘Greater love has no one than this, that he lay down his life for his friends’ (81). Interlaced with Christian ideas, a magical toy named Herobear, mystery, amazing adventures, and a kid with a better understanding of life than many people older than him, Herobear and the Kid: The Inheritance is a wonderful book that I think almost any Christian, whatever age, will enjoy reading. Note by Bone: Today’s article was brought to you by Flint and Bone’s younger sister, Arrietty (name changed to protect the innocent). Arrietty is a very interesting person who is very interested in writing poems (she’s written 140 to date) when she’s not doing other interesting things like reading books (mostly fiction), doing school (mostly fact), and practicing violin. Note 2: Herobear is difficult to find in print these days. I would recommend either buying the one-volume book new from a seller like Amazon for $50 (steep, I know),hunting around online for a less-expensive used copy, or looking for it at a public library.